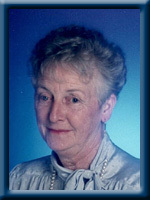 Burgess – Eva B., 79, passed away peacefully in Queens Manor, Liverpool on Friday, April 30th, 2010. Born December 28, 1930 in Lequille, Annapolis Co., she was the daughter of the late Frank and Jane (Fraser) Fairn. Eva is survived by daughters Nancy (Clarence) Ringer, Prince Rupert, BC, Nina (Douglas) Inness, Hunts Point, Beverley (Anthony) Parker, Mount Uniacke, Rhonda (David) Lacusta, Halifax, Cindy (Alan) Toney, Greer, S.C., son Stephen (Heather Cameron), Upper LaHave. Sisters Gertrude (Ralph) Curran, Halifax, Anne (Ernie) Zukiwski, White Rock, BC. Grandchildren Mike Ringer, Brian Ringer, Pam Inness, Jennifer Dobson, Laura Sanford, Kate Lacusta, Stephanie Lacusta, Maurin Frellick, Raul Frellick, Thomas Frellick, Mady Frellick. Five great grandchildren. Eva was predeceased by her husband Ronald Frellick, sisters Barbara Meisner, Mary Matkin, Jean Harvie. Brothers William and Murdo Fairn. Offer Condolence for the family of Burgess; Eva B. We are so sorry to hear of your Mom’s passing,She was a very well liked and friendly person who always had time for a little chat.She will certainly be missed .Our condolences to you all. To: Nina and family: We were sorry to hear about your mother. Our prayers and our thoughts are with you at this time. Remembering many happy hours spent with you, and your Mom at your home. My most sincere condolences. So sad to hear of Eva’s passing. Our thoughts are with you all. Pam and Family, Sorry to hear about your Grandmother, thinking of you all, take care. To Eva’s family so very sorry to hear of your mom’s passing! Our thoughts are with you all at this sad time! TO : Steve and family . Sorry to hear about your mom the other morning. Please pass along my condolences to all members of your family. We are saddened to hear of your loss. Eva was a lady, both kind and gracious. It was a pleasure having known her. Our thoughts and prayers are with you at this special time. Having met Eva in person, talked to her on the phone, got a sense of how funny she could be, and how her family meant a lot to her. We did enjoy our chats and letters, shall miss her. As we know she is in a better place than we could ever provide for her, but God can and did, know that she is a happier person today and she wants all of you to remember the good times you all had with her. Forever in our hearts. So sorry to read of your Mum’s passing. Our thoughts and prayers are with you at this sad time. I am saddened to hear about your loss. She will be missed and I am glad I had the pleasure of knowing her. Keep her memories alive! Our thoughts and hearts are with you in this, your time of loss. I am very sad about Eva’s passing. I was blessed to have known her during her time at Queens Manor. I so admired her outstanding memory, her compassion for others, her strength through adversity, and her deep love for her family. My thoughts and prayers to her beloved family and friends. We are so sorry to hear of the loss of your Mother,but she is at peace and in a better place with our Lord..We will keep you all in our prayers.May God bless you all and help you through this very sad time. to the family of EVA BURGESS. so sorry to hear of Eva’s passing. i have known Eva for a long time. It was a joy to talk with her , always pleasant and kind. She will be missed. To Nina and family, We was so very sorry to hear that your mom has passed away.I always had nice talks with her when I would go to the manor to see my dad.She will be greatly missed by her family and friends.Our Thoughts and Prayers are with you at this sad time. Very sorry to hear about your mother. I always enjoyed our chats at the Manor. My thoughts and prayers are with all of you. My prayer’s are with you all. I will miss Eva I knew her when I worked at Frenchy’s and Eva and I had many laughs at Queens Manor. Just read your mother’s obituary on Chandlers website and was sorry to hear about her passing. My thoughts and prayers are with you at this time. To Eva’s family :Your mother will be remembered as a lovely,pleasant lady.I extend sincere condolences to all. Our thoughts and prayers are with you all at this time of loss. We didn’t know Eva personally, but in our knowing Bev, she must have been a very special woman who raised a loving family. Nina and family: Our deepest sympathy to you and your family. May it comfort you to know that her suffering is over and you were always there for her when she needed you most. She was a great lady and you will miss her dearly. My thoughts are with you all…. So sorry to hear of your mom passing .I knew her for many years. She was a wonderful person. My sincere sympathy to the family. so sorry to hear of Eva’s passing….my thoughts and prayers are with you at this difficult time. Sorry to hear of Grandma Eva’s passing. She was a wonderful lady and enjoyed talking with her, she will be dearly missed by all that knew her. We were sad to read of your Mother`s passing. I always enjoyed our chats at the P. O. She will be missed by a lot of people. Our thoughts and prayers are with you at this sad time. So sorry to hear of your mom’s passing. She was a great lady. My thoughts are with you and your family at this time. Nina and Family, sorry to hear of your mothers passing.You and the family are in our prayers at this difficult time. Take care. sorry about the passing of your mom Bev, our thoughts and prayers are with you and your family at this sad time. To Nina and family,Sorry for your loss.Our thoughts and prayers are with you all.She will be missed. Sorry for you loss may she rest in peace. Sorry to hear of your mother’s passing. She was a great lady and will be missed. Sorry to hear of your mom’s passing. Our thoughts and prayers are with you. Nina and family, so hear about your Mom I always visit her when I went to the Manor on Tuesday`s we had a lot of nice chats together. She was a very dear friend of my Mother`s She was a sweet person, she will be missed. I went to see her Friday at noon before the lunchon Our thoughts and Prayers are with you. Hazel. So sorry to hear of your mother’s passing. My prayers and thoughts are with you and your family at this time. God Bless. prayers are with you at this time. We have fond memories of Eva in Liverpool on Bridge St when all the “children” would be playing together. Later meeting Eva at St Peters Church with Rhonda and family in Halifax. We always found lots to discuss.She was a sweetheart. We also met on a bus going to Bangor on a shopping trip. A fun time. So sorry for your loss. Our condolences to all the family. So sorry to hear of Eva’s passing.Eva made many friends at the Manor and will be missed dearly.God bless all of her family in their time of grief. I am so sorry to hear of your loss. There are no words for moments such as these. Eva must have been such an amazing woman because Cindy is one of the most amazing people I have ever met in my life. I love you very much Cindy. I am thinking of you. We were all very sad to hear of Grandma passing on. I’ll never forget how gentle and loving she was with our little Neven. She will be remembered. my sympathy to the family ,,a big miss in the manor …. Sorry to hear about Eva’s Passing. I know Gram (Jean) will be waiting to greet her and talk to her as it has been almost 2 years since they last talked! I cannot be there today but I am thinking of all of you. Please take care of each other and know that although it is never easy, it does get better with time and keeping the great memories alive. My thoughts are with you during this trying time…Take care of each other. Your mother was a lovely lady. Nina and family. I am so sorry to hear of the loss of your mother. Please accept my sincere condolences. So sorry to hear of your Mom’s passing. It will be a void never to be filled, but with memories and time it will get better. Our most sincere condolences. Our thoughts are with your family during this time. Nina, We were so sorry to her about your mother;s passing Our thoughts are with you at this difficult time. We were sorry to hear of your mother’s passing. Our thoughts are with you at this difficult time. I had just heard the unfortunate news regarding Eva’s passing. I apologize for the delay, I am so so sorry to have heard this. I was at the manor just last week and had Casey in to visit Eva, she smiled and laughed with us both. Eva was a lovely lady, I enjoyed conversations with her very much, she will be deeply missed. Recreation Dept at Queens Manor. Nina, and all your families,sisters & families– We are very sorry to hear of your Mom”s passing.We just read it today,don:t know how we missed it at the time.we are still adjusting to the loss of all our parents, it is a difficult adjustment to make.Bless you all in your sorrow.